Before you put your kiddie pool away in the garage for the fall consider this! Why not bring that pool in and make it into an amazingly fun ball pit and tent for your child to play with all winter long. I am so excited to share this project with you! My kids absolutely love it! Living in Wisconsin, this is the time of year that we are cleaning up all of our summer outdoor toys and furniture and storing them for the winter months. With a 2 and a 4 year old in the house winters here get very very long. We are always looking for ways to stay busy and active during the long winter months. My hope is that this will be an exciting and educational activity for them all winter long and help them burn of that extra energy when cabin fever sets in. We have had it up for a couple weeks and they have already gotten hours of fun out of it. First thing is first – clean and dry that kiddie pool and find a spot that it will fit into your home. The pool that we used is actually a small turtle pool. I faced the head of the turtle into the corner of my son’s room so it didn’t stick out into the middle of the room. I used 200 plastic play balls to fill the small sized pool. You can find these at any toy store or most department stores. The ball filled pool alone was super exciting for the kids. They spent the whole day rolling around in them and playing in their new ball pit. 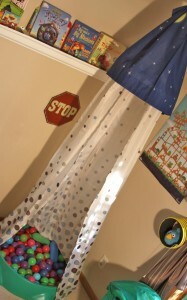 I wanted to try to incorporate it in a cute way into my son’s room without it looking out of place. 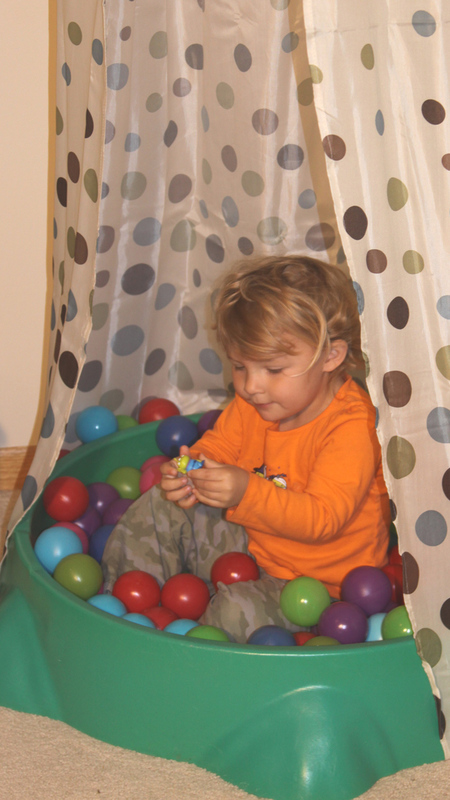 What makes a ball pit even more fun, a tent over it! 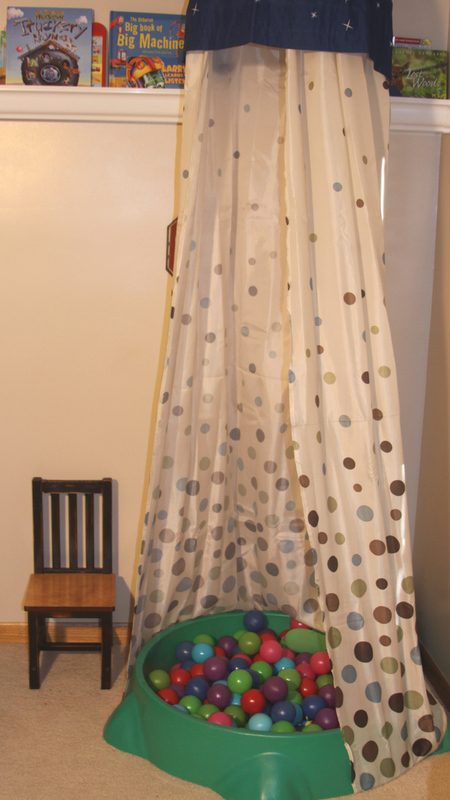 I purchased a really cute Polk-a-dot shower curtain at The Dollar General for about $10.00 – it also included the shower curtain rings. 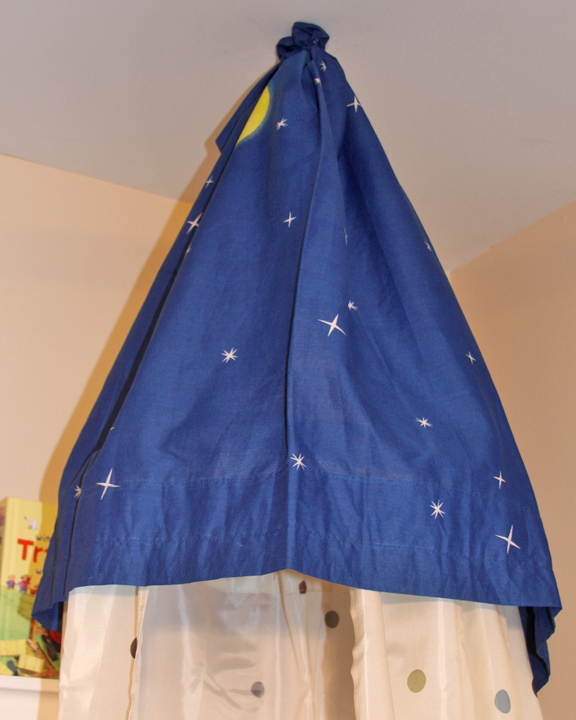 You could absolutely use a simple one color curtain for $1 to cut the cost on this project. You will be surprised at the mechanics of this tent. Very cheap and simple. I took a plain wooden decorative wreath from the dollar store and hung the shower curtain around it using the plastic curtain rings that it came with ( you can buy these at the dollar store too). After the shower curtain was attached I hot glued a large plastic hanger with a metal top (the kind you get from nice clothes when buy them) onto the top of my wreath. I made sure to space the rings around the wreath before I attached the hanger – so that it laid evenly. I tied a piece of twine to the hanger and hung it from the ceiling using an eye hole screw. The hanger and wreath weren’t necessarily pretty to look at so I added a piece of fabric around the top. I used an old window valence that we had with a cute star and moon print. I simply gathered the tip tightly around my eye hole screw and secured it by tying a piece of fishing line tightly around it. 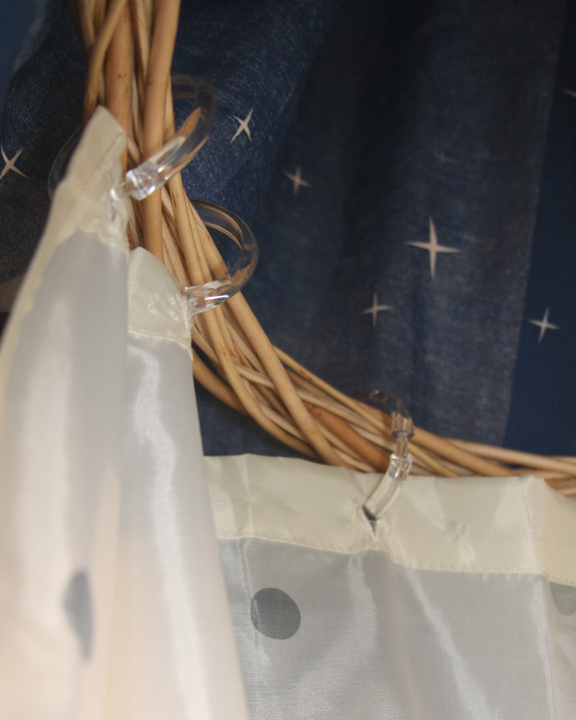 Make sure your fabric is lying nicely and covering the entire wreath the way you like it before you secure it. You now have a fabulous play tent to go with your super fun ball pit! To add an educational element to this toy I came up with an activity to help the kids with letters and spelling their names. It also helps with color recognition. 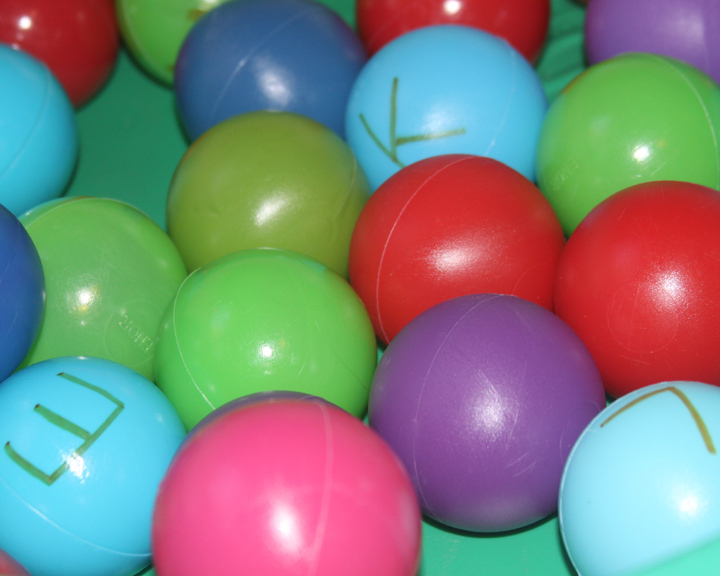 I wrote each child’s name onto a specific color of balls using permanent marker. 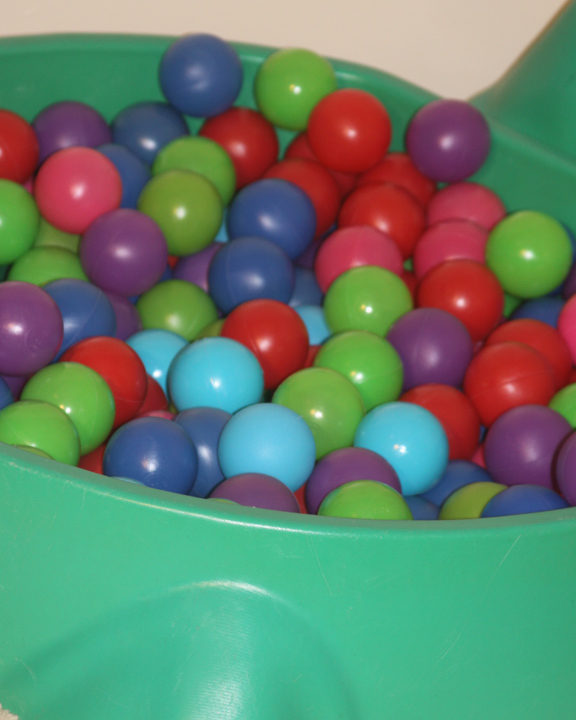 We mix the lettered balls into the ball pit with all the other balls. The kids can then search through the balls for the letters that are in their name. 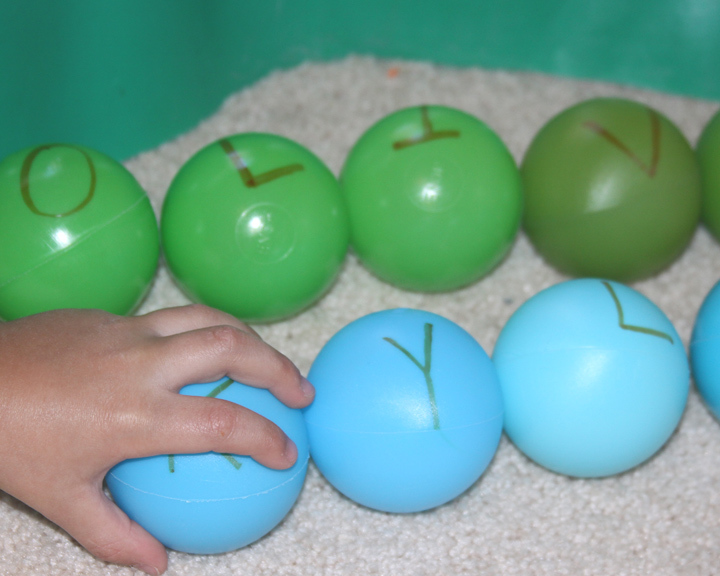 If they have trouble recognizing the letters I can tell them to look for the “green balls”. It is a great way for them to practice spelling their names and putting the letters in the correct order. Put that kiddie pool to use for the winter in a way that is fun and educational for your little ones! I am so excited to have this exciting activity for them to do this winter and even more happy that I made this using things that we already had. Yet another great idea! I will definitely be looking back through your blog when I have little ones of my own! LOVE this idea. I have an old turtle sandbox outside that I may have to try it with. You look like a super fun mom :o) My kids would go crazy with one of these things! Found you via The Idea Room. Enjoying looking around! I’m so glad you found A Spotted Pony! My kids do get really crazy in their pool and balls fly everywhere 🙂 Those smiles and giggles are totally worth the effort of putting this together- they really have a good time in it! P.S. Thanks for saying I look like a super fun Mom – that is the best compliment a Mom can get!! Thanks!